Max Occupancy: 5 These large pine Cabins sleep 5 guest. Our large pine Cabins sit below Spirit Mountain with a spectacular view of Iron Mountain. 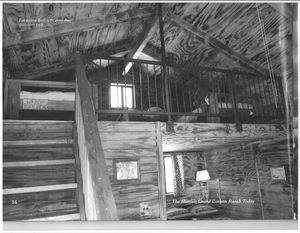 The main area includes a queen and twin bed, with historic gas fireplace and air conditioner in summer, table and chairs, and rocking chairs on the porch. The large upstairs loft has 2 twin beds and lamps. 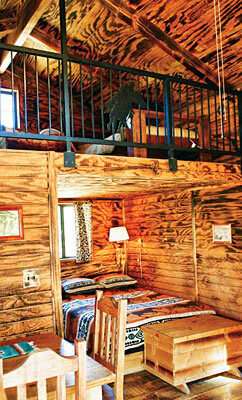 These custom cabins include numerous historical pictures and western artifacts. The bathroom is fully equipped has a historical claw foot bathtub and shower.